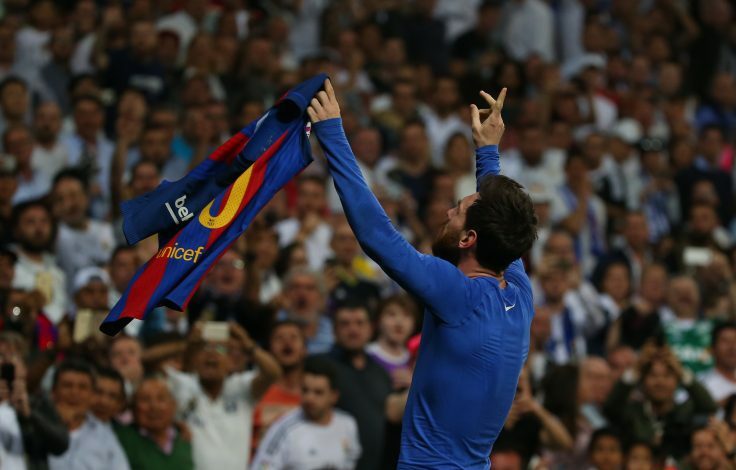 Argentine hitman Lionel Messi’s brace silenced the Bernabeu as Barcelona took three points from their trip to the Spanish capital. Luis Enrique’s side had a point to prove after crashing out of the Champions League earlier in the week, and they brought themselves back into the La Liga race with a victory over Real Madrid on Sunday. Zinedine Zidane’s side took the lead, thanks to some calamitous defending by Barcelona, when Casemiro found himself at the right place to nod home. But it did not take long for Lionel Messi to stamp his authority on the game, as a swift one-two with one of his teammates put him one goal. He finished with ease to take his side home on level terms. The Catalan giants dominated the game after the break, and finally took the lead through a sumptuous goal from Ivan Rakitic from outside the box. It was worthy of winning a game like the El Classico and it looked like it would be one, as Real Madrid skipper Sergio Ramos picked up a red card not too long after the goal, for a dubious challenge on Lionel Messi. Stopping a clear counter-attack and plunging with his foot in the air, Ramos could not have too many complaints on seeing a straight red, which made it difficult for the European champions. However, even when down to 10 men, Zidane put on James Rodriguez to salvage something from the game and the Colombian responded in fine fashion, finding the back of the net with less than four minutes to play. It looked like Barcelona were taking just a point from this tie, but in the last minute of stoppage time, Sergi Roberto’s sprint through the middle opened up the Real Madrid defence and gave Barcelona a chance to come back. And that chance fell to one Lionel Messi who made no mistake. Keylor Navas, who made a number of incredible saves throughout the night, was beaten at the near post by pinpoint accuracy from the Argentine. Barcelona are now level on points with Real Madrid, who have a game in hand and are right back in the title race.